A new bistro recently opened up in Aerocity by the name - Reve. 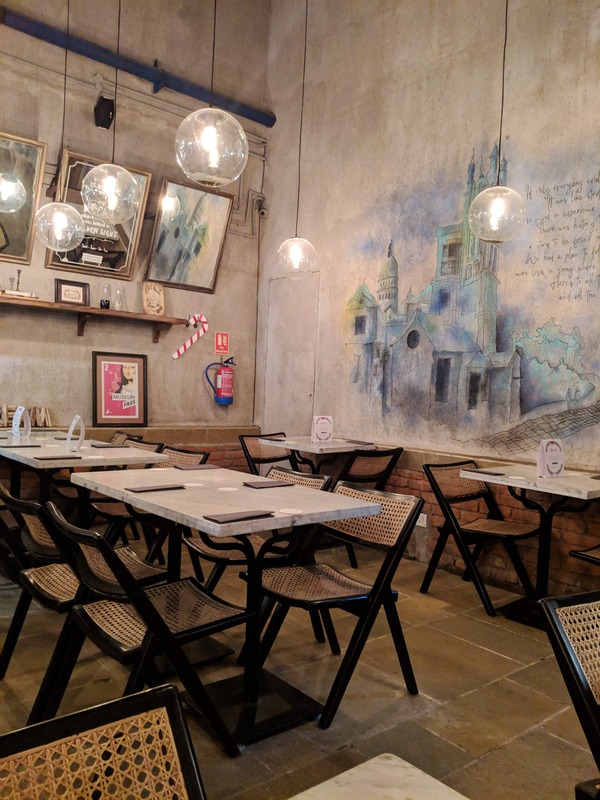 They have beautiful interiors, a cosy vibe, and they serve delectable French cuisine. Decorated with glaze bollamp hanging from the ceiling, a hand-painted castle wall, and a cosy shelved corner, this place is very welcoming. Reve is not just about beautiful interiors, but they also serve delicious French food & mocktails. We started off by ordering La Mer and Pure Cinn from their mocktails menu. La Mer is a cold brew coffee with pineapple, cardamom, and almond, whereas, Pur Cinn has fresh orange chunks and cinnamon balanced with lime served over ice. I fell in love with Pure Cinn right after the first sip. For starters, we tried Canapes and Chicken Liver Parfait which tasted good. Order this liver parfait only if you can stand the smell of liver and enjoy the different taste. For the main course, we tried the following: - Fish Meuniere, a juicy and delectable combination of pan-fried sole with brown butter and lemon sauce served with baby potatoes and sauteed beans on the side. - Chicken Ala Kiev; crumb fried chicken breast filled with butter which was again served with baby potatoes and sauteed beans on the side. As you continue eating, the melting butter oozing out of the chicken makes the dish taste better (if that's even possible). - Leaving the best for the last, we ordered Pork Normandy which is slow-braised Belgian pork belly served with apple puree and sauteed spinach. I have never tasted such tender and well-cooked pork in my entire life. It was melting in our mouth with every single bite. This dish is a must-try./ In dessert, we tried the Vanilla Custard Profiteroles which were served with fresh fruits on the side. These rolls have a salty and flaky outer crust/ layering with vanilla filling on the inside. Pro-tip: Instead of breaking the roll, just put the entire roll in your mouth with some fresh fruits to get that sweet and tangy flavour. Reve lived up to its reputation and served us a delicious apple tart. Oh, and their Mocha Pot De'creme is a delicious dark chocolate and coffee custard. The service could be quicker.